Even though upvc door security has evolved dramatically we still see upvc doors that have old outdated locking mechanisms. 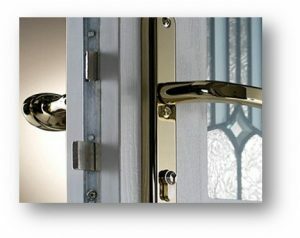 The most popular locking mechanisms today have hook locks which provide high security for your upvc door. However, explaining that a door has a hook lock mechanism doesn’t explain a lot. Upvc doors have a 3-point locking mechanism plus extra cam head sliders with a central deadbolt. A 3 hook locking mechanism has 3 solid steel hooks that will engage into steel keeps within your actual upvc door frame once you have lifted the handle and engaged the lock. We also have steel cam head rollers which slide behind a solid steel keep located on the upvc door frame once you have engaged the mechanism. Once you have lifted the handle and fully engaged the locking mechanism a central deadbolt (solid steel bolt) will engage into the steel keep located again in the centre of the upvc frame. As you can see this type of locking mechanism has very high security benefits and with the 3 hook system that we supply with all our doors you CANNOT crowbar the boor open from any angle. You would simply have to break through the full door to gain entry into your home. Choosing a external upvc door that provides the best thermal efficiency is very important since you want to try and keep as much heat in your home as possible especially with the rising energy costs. All doors should also come as standard with toughened double glazed panels/units. If you are thinking about a upvc back door then most people choose a simple split door with a double glazed unit in the top, mid-rail then a pvc panel at the bottom. The half panel upvc can have decorative moulding, such as Georgian bar effect and many others but make sure to ask how the panel is rein forced. Instead of having a toughened safety glass you can have 6.4 laminated safety glass which offers we believe more security than toughened glass. The most decorative features on a upvc door would be the panel which can be changed at any time. The upvc door panel fits inside the casement of your door. The panel will have the decorative moulding you have chosen and also the double glazed unit with any chosen lead designs, glass pattern and colours. Having a up to date range of door panels to choose from will make sure that you can choose form the most contemporary designs making your home stand out. If you currently have a side window frame next to your door, then this can also be replaced and produced to fit in nicely with your new upvc door. If you choose to have any intricate lead designs whether it be Georgian lead, Gothic lead, Tudor lead, diamond lead or a queen Anne leaded design these can all be replicated to follow in-line with your upvc door lead design. How Much Do Lean-to Conservatories Cost?